Hello. I thought I would share my great news of the day. 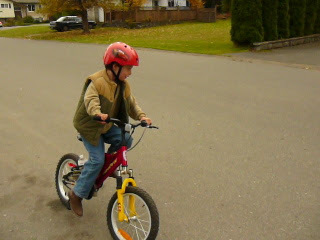 My son started pedaling a bike with no training wheels on it today. Oh, he was so excited!! He kept yelling, "Yea hooo! Yea hooo!" It was so cute and tear jerking. When he was younger his foot would always fall off the pedal, so we got a strap for his affected foot. Then the mountain bike we got had handles that he felt were too far for his shorter affected arm and too high so he felt unsafe, so I bought him and his brother a balance bike. This was the best thing I have ever done, no peddles but man he learned how to balance in a month or so and could go flying everywhere with it, and he opened his hand and placed it on the handle. So today when he got on this new shorter bike, with no training wheels, and handles that are closer to him, he was flying around on it like a balance bike, and I said, "Hey! The hardest part of riding a bike is balancing and you have that down, so why don't you peddle?" So he put his feet up and wobbled like twice then was on his way!!! Oh, his face! I never knew if he would ride because his right hand has very tight muscles because of the hemiplegic cerebral palsy and his leg used to slip. His riding a bike is my good news of the day! !